This is the Peru La Familia Guzman brought to you by Dillanos. 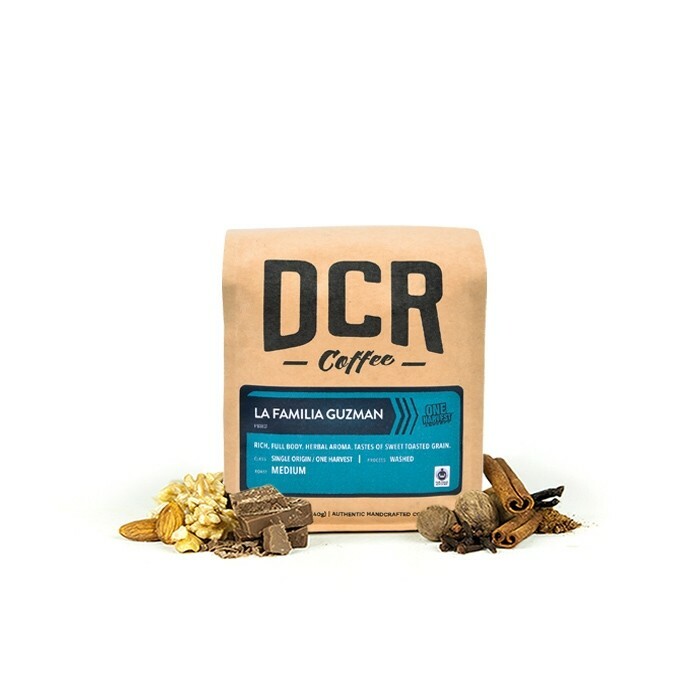 This fully washed coffee was grown by the Guzman Family in the Naranjas region of Peru at 900 meters above sea level and is Organic and Fair Trade certified. Enjoy the mellow, rich cup with notes of chocolate and roasted nuts. Very good! The aroma is rich and strong, and the taste is full. Delicious nutty, earthy, caramel flavors. Not overpowering, but still distinct. Not dark enough, not enough body, not enough taste. Mellow and tasty, but a little on the bland side. Not quite as nutty & rich as I would like. I do not note the chocolate tones of the coffee, but the rich, nutty flavors are immediate, and the coffee has an all around earthy-ness that is really enjoyable. I have tried in a French Press as well as drip and this bean seems to prefer the press. Not very nutty, chocolatey, or rich. Still good, just mellow and pleasant. It smells delightful, however, it's actually quite light and doesn't have much flavor. Disappointed on this one. Simple but very good, rich coffee taste. I'm not usually a fan of medium roasts, as they typically taste like green wooden sticks to me. However - in this case, the aroma is good, and so is the taste. Getting a good richness, with something a bit like a lingering smokiness. Flavor profile was spot on. Great as iced coffee. A fairly mellow coffee. On the medium to dark side, but not too aggressive. I've had this before and it was excellent! However, for some reason this shipment tasted burnt, and we could not finish the roast. We had to throw it out. We love Dillanos but I fear that this bag was not perhaps Quality Controlled. I'm a big fan of the chocolate-y flavor. It is very rich and it's not bitter at all, which is awesome. Flavor is almost sour. Not fun to drink. Bad aftertaste. Good rich flavors, a little too sweet for my liking. This was a dark roast than medium for sure and I feel like the beans were burned. I tried them with different grind levels and still tasted too bitter. Excellent balance with a sweet, full finish. Notes of fruit, toasted almonds and a definite chocolate hit. Acidic bite initially, but seems to level out through the cup. I really liked this coffee. Brewed on an Aeropress and tasted strong notes of chocolate and nut. This quickly became an office favorite. I loved this coffee. It was great. Exactly the flavors I prefer in my coffee. I just received the next coffee and it was well timed. I love it, ordered more. My wife thought a bit bitter which I can taste a bit. Maybe try something stronger next? Didn't care for it. Appearance, smell, and taste all seemed to be a darker roast than I prefer. I can tell by the taste that this is high quality stuff. 3 stars on the 5 star rating but if this was a one to ten chart I would rate this about a 7.5 Really good stuff and I would gladly buy this at the store if it were available the only reason it doesn't get more stars is because it's not my favorite which would be 100% kona coffee. I'm not saying that this coffee isn't on par with it with quality this is just my preference but overall this is really good coffee.